Past and present players from across the CHL recently attended NHL Rookie Camps, looking to make a good impression ahead of the 2018-19 season. Several teams competed in organized rookie tournaments. Here’s a look at top performers from the Traverse City Prospects Tournament, HarborCenter Prospects Challenge, Vegas Rookie Faceoff, Estero Prospects Showcase, the Penticton Young Stars Classic and the Laval Rookie Showdown. The Columbus Blue Jackets ruled the Traverse City Prospects Tournament, playing to an undefeated 4-0 mark while outscoring opponents 20-10. Trey Fix-Wolansky (Edmonton Oil Kings), Kole Sherwood (Kitchener Rangers) and free agent invite Jordan Sambrook (Sault Ste. Marie Greyhounds) were key performers. 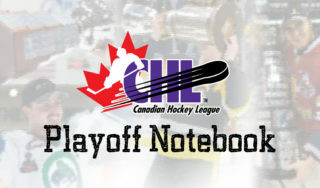 Jason Robertson (Kingston Frontenacs) led the event in scoring with nine points (2-7–9) in four games, helping the Dallas Stars play to a 2-2 record. A native of nearby Northville, MI, Robertson’s impressive showing included a three-point (2-1–3) effort in a 5-4 loss to the Minnesota Wild and a four-assist performance in a 7-5 win over the New York Rangers. Other Dallas standouts included free agent invite Ben Gleason (Hamilton Bulldogs) and 2018 first round pick Ty Dellandrea (Flint Firebirds). The top CHL selection at the 2018 NHL Draft, Carolina Hurricanes forward Andrei Svechnikov (Barrie Colts) led his team in scoring with four points (2-2–4) in as many games. 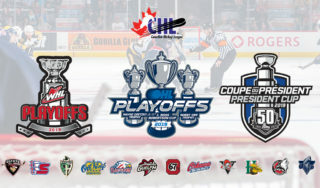 Other CHL players atop the tournament scoring leaders included Detroit’s Joe Veleno (Drummondville Voltigeurs), St. Louis’ Jordan Kyrou (Sarnia Sting) and Detroit’s Dennis Cholowski (Portland Winterhawks). The host Buffalo Sabres, Boston Bruins and New Jersey Devils came away with 2-1 records while the Pittsburgh Penguins went 0-3 at the 2018 HarborCenter Prospects Challenge in Buffalo, NY. Former CHL Rookie of the Year Alexander Nylander (Mississauga Steelheads) of the Buffalo Sabres finished second in event scoring with five points (3-2–5) in three games. Other prominent Sabres scorers included free agent invite Cole Coskey (Saginaw Spirit) and 2018 fourth round pick Matej Pekar (Barrie Colts). The New Jersey Devils had strong performances from a pair of CHL grads in Blake Speers (Sault Ste. Marie Greyhounds) and blueliner Colby Sissons (Swift Current Broncos) as each had three points. Michael McLeod (Mississauga Steelheads) and former Shawinigan Cataractes forward Brandon Gignac both scored twice. In goal, CHL netminders in Boston’s Kyle Keyser (Oshawa Generals) and Buffalo’s Ukko-Pekka Luukkonen (Sudbury Wolves) recorded wins for their respective clubs. The Anaheim Ducks finished with a perfect 3-0 record, outscoring opponents 21-9 at the Vegas Rookie Faceoff as Maxime Comtois (Drummondville Voltigeurs), Kyle Olson (Tri-City Americans) and Sam Steel (Regina Pats) played prominent roles in the success. Jack Kopacka (Sault Ste. Marie Greyhounds), Hunter Drew (Charlottetown Islanders) and Josh Mahura (Regina Pats) also contributed as the Ducks came out on top. The San Jose Sharks finished 2-1 on the weekend as goaltender Zachary Emond (Rouyn-Noranda Huskies) opened the showcase with a 33-save shutout against Arizona. Jacob McGrew (Spokane Chiefs) scored a few goals while Ivan Chekhovich (Baie-Comeau Drakkar) and Jayden Halbgewachs (Moose Jaw Warriors) also found the scoresheet. The host Vegas Golden Knights also finished at 2-1 as Kelowna Rockets grad Gage Quinney played a big role offensively. 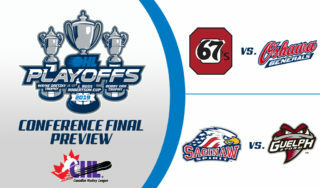 Reigning OHL Defenceman of the Year Nicolas Hague (Mississauga Steelheads) scored three times while Seattle Thunderbirds grad Keegan Kolesar and recently named Niagara IceDogs captain Ben Jones were also producers. Former Golden Knights first round pick Cody Glass (Portland Winterhawks) was one of the top offensive players in the tournament. The Arizona Coyotes finished with a 1-2 record. Former Sudbury Wolves defender Kyle Capobianco scored a pair of goals in a bounce-back 4-2 win over the Los Angeles Kings before the ‘Yotes fell 8-4 to the Anaheim Ducks. Jeremy McKenna (Moncton Wildcats), Tyler Steenbergen (Swift Current Broncos) and Brayden Burke (Moose Jaw Warriors) were also goal-scorers for Arizona. The Colorado Avalanche rebounded from a pair of losses to defeat the San Jose Sharks 6-3 in their final game. Brandon Saigeon (Hamilton Bulldogs) scored in all three games for the Avs while Brandon Wheat Kings grad Ty Lewis and Matthew Boucher (Quebec Remparts) were also contributors. Saigeon scored twice in Colorado’s tournament-closing win. The Los Angeles Kings went 0-3 in Vegas but bright spots included Jaret Anderson-Dolan (Spokane Chiefs), Mark Rassell (Medicine Hat Tigers) and Michal Ivan (Acadie-Bathurst Titan). Sherbrooke Phoenix graduate Mathieu Olivier scored twice to help the Nashville Predators lead-off the 2018 Prospects Tournament in Estero, Florida with a 5-4 win over the Washington Capitals. The Preds entered the third period down 3-2 but battled back to start the tournament on a winning note. Former Gatineau Olympiques standout Yakov Trenin also scored for Nashville. The Predators came out on top once again in their second game, defeating the Tampa Bay Lightning by a score of 5-3. Trenin scored again for the Predators while Kelowna Rockets grad Justin Kirkland added an empty netter. Soo Greyhounds forward Taylor Raddysh and Erie Otters grad Erik Cernak provided Lightning goals. Washington rebounded from an opening game loss in Game 3 of the tournament as they blanked Tampa Bay 5-0. 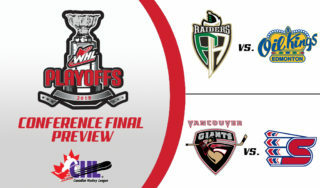 Riley Sutter (Everett Silvertips), Beck Malenstyn (Swift Current Broncos) and Kody Clark (Ottawa 67’s) all scored for the Caps. The Capitals finished off the showcase with a high-scoring 8-5 win over Nashville. Everett Silvertips teammates Garrett Pilon and Riley Sutter were in on each of Washington’s first three goals with Pilon scoring twice while Regina Pats grad Connor Hobbs also lit the lamp. Malenstyn, Clark and Eric Florchuk (Saskatoon Blades) also found the scoresheet. 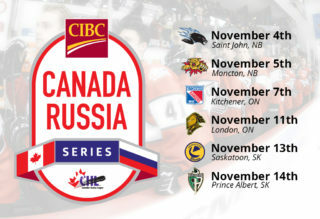 Sutter led all players in the tournament with three goals while Caps defenceman Alexander Alexeyev (Red Deer Rebels) tied for the event lead with four assists. The Vancouver Canucks and Winnipeg Jets played a pair of games in Penticton, BC, with the Canucks coming out on top in both matchups. A pair of Owen Sound Attack products in Jonah Gadjovich and Petrus Palmu both scored twice in an opening 8-2 win for Vancouver while Windsor Spitfires netminder Michael DiPietro got the win in goal. In the second game, London Knights graduate Olli Juolevi set up fellow Canucks first rounder Elias Pettersson for his third goal of the weekend while Swedish winger Jonathan Dahlen scored a pair in a 6-4 Vancouver triumph. Shawinigan Cataractes grad Alex D’Aoust scored a goal for Winnipeg in the loss. The Ottawa Senators won both their contests at the Laval Rookie Showdown, getting a goal from Alex Formenton (London Knights) in a 4-0 win over the Montreal Canadiens to start the event. Formenton netted the 3-on-3 overtime winner in Ottawa’s 6-5 win over Toronto a day later. 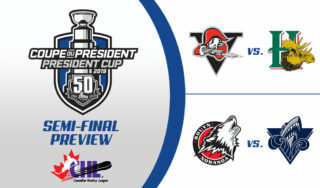 Jordy Stallard (Prince Albert Raiders), Regina Pats grad Boston Leier, Luka Burzan (Moose Jaw Warriors) Brady Lyle (Owen Sound Attack) and Drake Batherson (Blainville-Boisbriand Armada) also scored in the victory. Kevin Mandolese (Cape Breton Screaming Eagles) collected the win in goal. The Leafs finished with a 1-1 record as Semyon Der-Arguchintsev (Peterborough Petes), London Knights grad JJ Piccinich and former Regina Pats captain Adam Brooks found the back of the net in a 6-5 overtime loss to Ottawa. Toronto followed-up by defeating Montreal 4-2 in the tournament finale. Windsor Spitfires grad Jeremy Bracco and Giorgio Estephan (Swift Current Broncos) lit the lamp while Zachary Bouthillier (Chicoutimi Sagueneens) was the winning goaltender. Montreal finished with an 0-2 record, being blanked by Ottawa in the opener before Cole Fonstad (Prince Albert Raiders) and Blainville-Boisbriand Armada grad TJ Melancon scored in a 4-2 loss to Toronto. Will Bitten (Hamilton Bulldogs) had a goal and set up another. Seattle Thunderbirds defenceman Jarret Tyszka suffered a concussion in the final game of the tournament following a collision with fellow WHL player Hudson Elynuik (Spokane Chiefs).